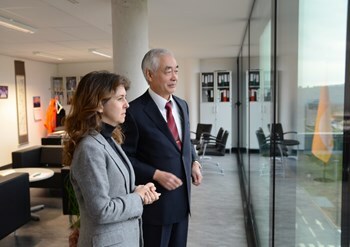 Ms Deniz Erdoğan Barım, the Turkish Consul General in Marseille (seen here with DG Motojima), visited the ITER construction site on Wednesday 29 January. Her country, highly dependent on fuel imports needs ''to contemplate all the [energy] options'', including fusion. With only 26 percent of its national demand for energy met through domestic resources, Turkey is highly dependent on fuel imports, primarily oil and gas. Electricity production has already doubled since 2001 and will have to double again by 2020 in order to meet the needs of the fast-growing economy. Turkey aims to produce 30 percent of its electricity by way of renewables in 2023 and intends to establish 10 gigawatts of nuclear capacity by 2030. In this context, fusion energy is the focus of strong interest from Turkish laboratories, government circles and utility companies. "We need to contemplate all the options," said Ms Deniz Erdoğan Barım, the Turkish Consul General in Marseille, who visited the ITER construction site on Wednesday 29 January. "It was very important for me to take the measure of the ITER Project, of the complexity of its organization and of the challenges of its schedule." The Consul General showed great enthusiasm for ITER and fusion energy as she discussed the project at length with ITER Director-General Osamu Motojima, who welcomes Turkey's interest in ITER.